The Centre for Public Impact published a report earlier this year on policy impact with the Royal Society of Arts. It followed a number of roundtable meetings that discussed different aspects of future policy practice. You can download the full report here. 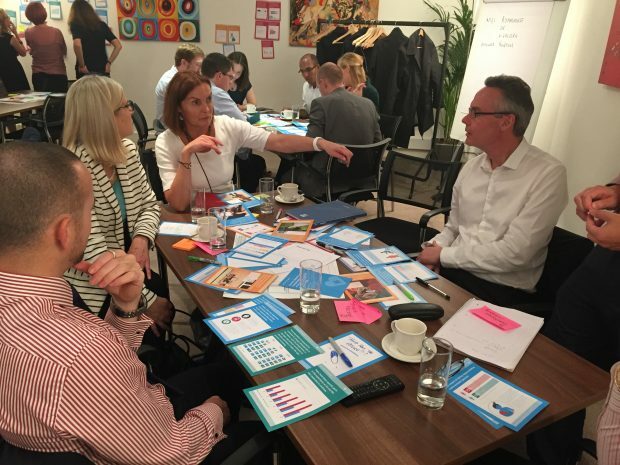 In the CPI report Barry Quirk, Chief Executive of Lewisham, distinguishes between the ‘art’ of politics, the ‘science’ of policy and the ‘craft’ of delivery. In the Policy Lab we bring these three distinct disciplines together, considering complex systems change using the power of all three. We work with hybrid knowledge, acting as what some academics call ‘boundary spanners’. Bridging together different disciplines, crossing organisational boundaries and artificial silos is important when we think about next practice. When we think about the future we try and avoid limiting the possibilities too early. We know that multiple technology futures will collide in the real world as they meet social needs and wider economic forces. 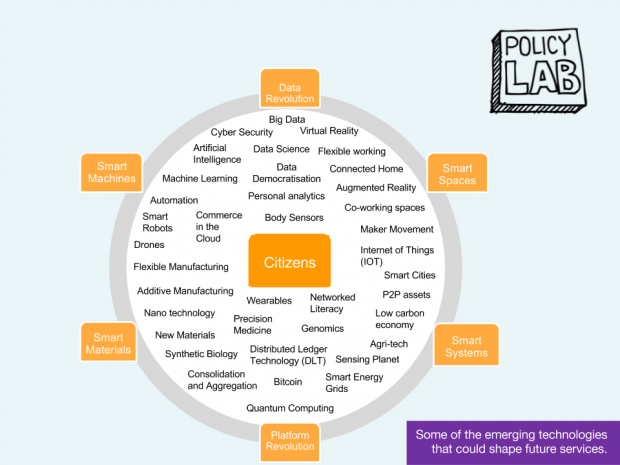 Our futures wheel shows just a few of the things that are likely to shape this future policy context. I recently created this to illustrate some of the emerging technologies that we are coming across in our projects. How these will blend together remains to be seen, but we can be sure that the context for future policy will be different to that from which our current evidence base was generated. After all, good science fiction is bound by the limits of what is imaginable at the time it was created (see Vasant’s recent blog on futures ‘in the sky’ and Cat’s on the future of rail). We can use the past to predict the future, but we can’t ever fully account for the unknowns. Instead, we make ‘best guesses’ using abductive logic and put them in the world to test and evolve through a process of discovery and iteration. This is sometimes called design thinking, but is really abduction as Business Professor Roger Martin notes ‘Whether they realise it or not, designers live in Peirce’s world of abduction; they actively look for new data points, challenge accepted explanations, and infer possible new worlds’. Many of the Lab projects infer possible new worlds as the setting for future policies before testing and refining them. 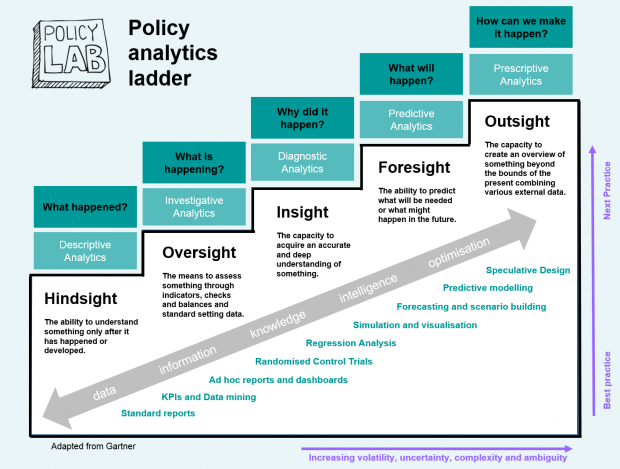 In our latest Slideshare I have added a policy ladder to start to map out different kinds of tools we have been using in the Policy Lab in the extremes of best practice and next practice.